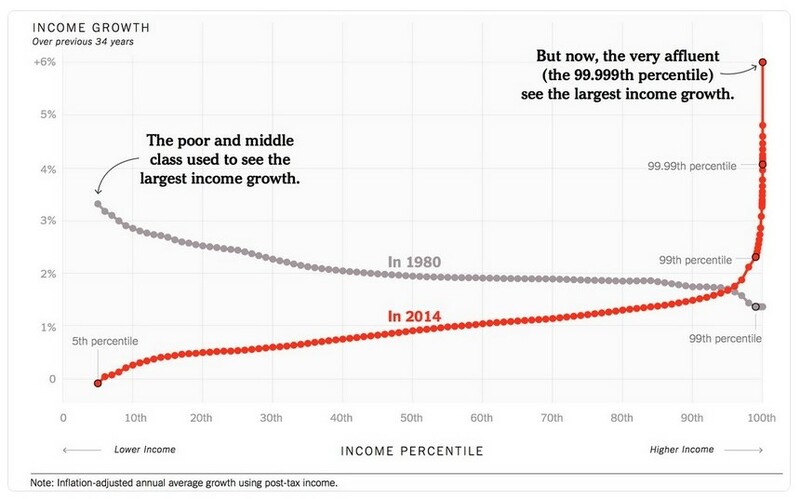 If you ever believed that the inequality levels we’re seeing today in most so-called developed economies are inevitable, not so very remarkable, and not as extreme as some might have us believe, economists Thomas Piketty, Emmanuel Saez and Gabriel Zucman have produced a graph that demonstrates the problem, well, rather graphically in the New York Times. It doesn’t take a genius to see that something has gone very badly wrong. In the language that those at the top of the tree in a country like the United States so often like to use, there are winners, and there are losers here. And the losers in fact, are pretty much all of us. The winners? A tiny, tiny proportion of the population. And this was by no means inevitable. 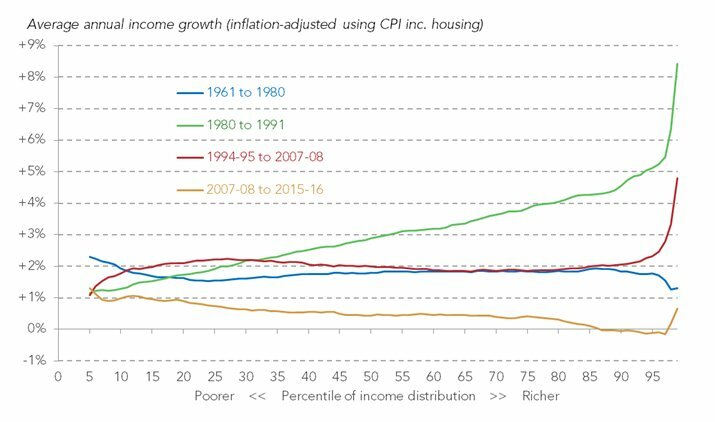 It was a result of policy decisions based on either a willful misunderstanding of economics, or perhaps politicians from the 1980s onwards really don’t understand what happens to economies when you systematically implement measures that use rising productivity to distribute wealth and economic gains upwards and strip back the income increases that, until that point, ordinary families were getting. At the core of the “supply side” revolution that Margaret Thatcher and Ronald Reagan pushed through in the 1980s was a simple idea propagated by Arthur Laffer: cut taxes on rich people and powerful companies and they will boost economic growth to the point that tax revenues will actually rise. Like many simple and beguiling ideas, this was simply wrong. It never happened. But politicians the world over were seduced by this lazy thinking, and the lobbyists of the rich had a field day. Not only have the tiny proportion of super-rich gained disproportionately, but they’re also the group of people least likely to be paying their fair share of taxes. So, us ‘losers’ are getting hit twice. Now, wouldn’t it be interesting to see how the UK experience compares? We suspect it would be even more stark than in the US case.